ZEBULON, N.C. - The Carolina Mudcats are excited to announce two new celebrity appearances to their already jam-packed promotional schedule as actor Tom Guiry or "Smalls" from the movie "The Sandlot" and Hall of Fame pitcher Rollie Fingers will both appear at Five County Stadium this season. 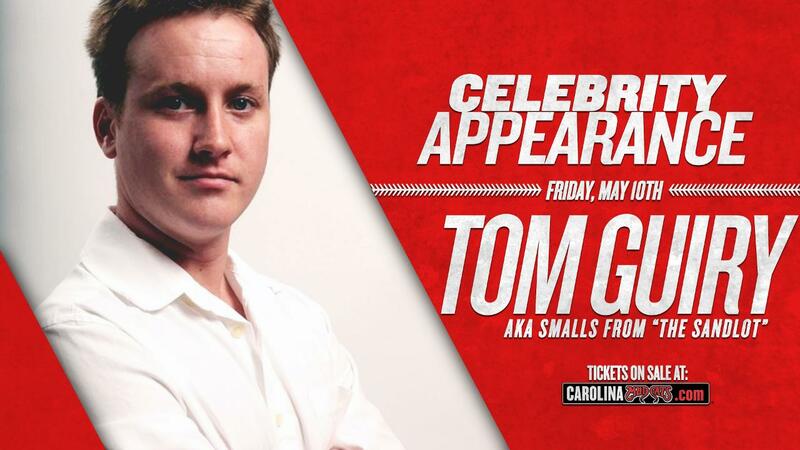 Tom Guiry's visit to Five County Stadium is scheduled for Friday, May 10 when the Mudcats play the Myrtle Beach Pelicans. Mr. Guiry's appearance will coincide with Family Campout Night and House Autry Friday Night Fireworks. Giury will be available to meet with fans and sign autographs throughout the night. Guiry is best known for his lead performance in 1993's The Sandlot, but has also appeared in major films including U-571, Black Hawk Down, Mystic River, Black Irish, and The Revenant. His appearance at Five County Stadium follows the announcement that Dennis Haskins, also known as "Mr. Belding" from "Saved by the Bell" will no longer be able to appear at Five County Stadium this season. Rollie Fingers will headline the Mudcats' third annual Brewers Weekend at Five County Stadium when he comes to Zebulon on Saturday, June 15 (vs. Winston-Salem). Fingers was inducted into the National Baseball Hall of Fame in 1992 and was a seven-time All-Star, MVP, Cy Young award winner and World Series MVP during his 17-year Major League career. He spent four of those 17 years with Milwaukee, beginning in 1981 when he was named the American League's Most Valuable Player. He finished his illustrious career with Milwaukee in 1985 and pitched for the Brewers for four seasons overall (1981-1985). The June 15 Brewers Weekend game includes the Rollie Fingers appearance and a Jesus Aguilar souvenir bobblehead giveaway for the first 1,200 fans through the Five County Stadium gates. The first pitch is scheduled for 5:00 p.m., but gates will open at 4:00 p.m.